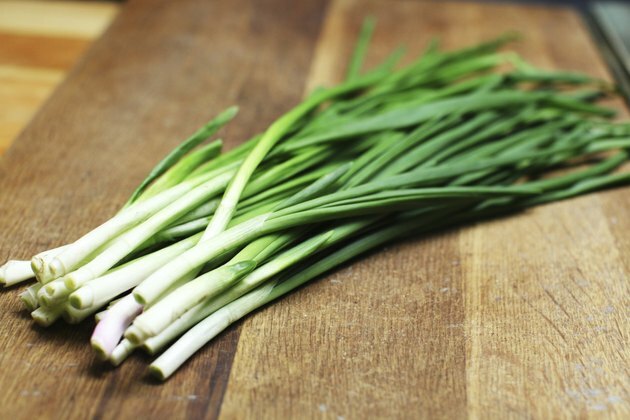 Native to Asia, green onions -- also called scallions -- should make make regular appearances in health-conscious kitchens. Like white onions, they add pungent flavor to your dishes, though green onions are milder, so even if they're used raw, they won't overpower the taste of your dish. Green onions also come loaded with nutrients your body needs, so they make a healthful addition to your diet. Green onions are low in calories -- even a whole cup of green onions only boosts your calorie intake by 19, or 1 percent of the calories in a standard 2,000-calorie diet. The majority of these calories come from carbohydrates, and each cup of green onions contains 4 grams of total carbs, including 1.3 grams of dietary fiber. These carbs provide energy that your tissues need for day-to-day functioning, and dietary fiber promotes healthy digestion. Green onions contain just small amounts of protein and fat -- less than a gram of each per serving. Adding green onions benefits your eyes because they contain carotenoids, including vitamin A, lutein and zeaxanthin. Vitamin A plays a central role in healthy vision, and failing to get enough of it in your diet negatively affect your eyesight and makes it difficult to see at night. Lutein and zeaxanthin work together to keep your eyes healthy. Consuming them protects your cells from damage and fights macular degeneration, explains the University of Maryland Medical Center. Each cup of green onions contains 2,840 international units and 609 micrograms of lutein and zeaxanathin. This provides 95 percent of the recommended daily vitamin A intake for men and the entire daily intake for women, according to the Institute of Medicine. Incorporate green onions into your diet and you'll also reap the benefits of their vitamins C and K content. These nutrients both offer benefits for the health of your skeleton -- vitamin C helps you synthesize the collagen that keeps your bones strong, while vitamin K helps your body utilize the calcium it needs to maintain bone density. Vitamin K also controls blood clotting, while vitamin C acts as a antioxidant and protects your tissues from damage. A 1-cup serving of green onions contains 111 micrograms of vitamin K -- 89 percent of the recommended daily intake for men and the entire recommended daily intake for women, according to the Institute of Medicine. Each serving of green onions also boasts 10 milligrams of vitamin C -- 11 percent and 13 percent of the recommended daily intakes for men and women, respectively. Add green onions to your favorite salads -- their flavor works well with a mixture of black beans, corn, quinoa and chipotle lime dressing, or with a mixture of whole-wheat couscous, diced mango and jalapeno, and fresh cilantro. They also make healthful additions to wraps or sandwiches, or as a garnish for soups. Alternatively, slice green onions in half lengthwise, lightly coat them with olive oil and then roast them in the oven until the edges turn golden brown, or saute sliced green onions in a mixture of olive oil, minced garlic and lemon zest.